While we all wish that our homes had all the space we could ever need or want, we all make do with the space we have. Most women would love to have enough space in their bedroom for a full size vanity with a lighted mirror for putting on make-up. While that simply isn’t a reality for many women, a lighted make up mirror can turn your desk, a counter top or even a high stand into a temporary vanity for your use. To help you find the right mirror for you, here is our review on the best makeup mirror with lights. 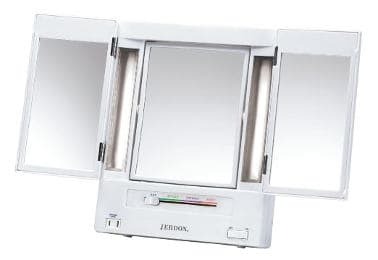 The Jerdon tri-fold lighted mirror is handy for those wishing to put on makeup or shave and need a lighted mirror for using in rooms with less than adequate light. It has a handy electrical outlet that you can plug in a curling wand into and the fluorescent bulbs are replaceable. The mirror itself is about a foot tall and 18 inches wide. Users state that when using the lights for this mirror you need to hold the on button for 5 to 10 seconds before the light turns on. What Do The Consumers Say? The lights are nice, bright and adjustable. Mirror tilts easily to allow you to see yourself from different angles. This is a nice hinged lighted makeup mirror that actually consists of three mirrors, which allows you to view your face from all angles. 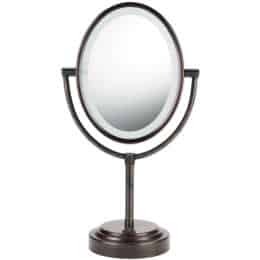 While smaller than a traditional vanity mirror, this one is a good substitute for people who simply don’t have the room for a traditional makeup vanity. 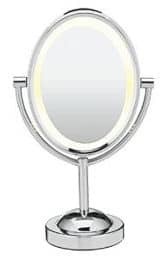 The Conair company is well known for its grooming products and the Conair oval double sided lighted mirror is designed to make putting on makeup flawlessly easier than ever before. 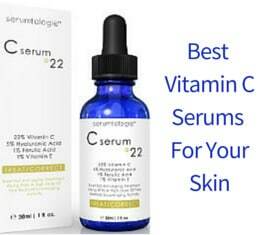 This product comes with a soft white light which is quite flattering to most people. It has a plug outlet in the back for plugging into curling wands or the such. The mirror tilts for a better view and the 7X magnification makes tweezing the eyebrows a simple task. Oiled bronze finish on mirror. Halo Lighting, fog free viewing. Mirror including stand is about 16 inches tall. Replacement light bulbs for this product can be expensive and difficult to find, but some users state that there are different brands of night lights you can use as replacement bulbs saving you money and frustration. 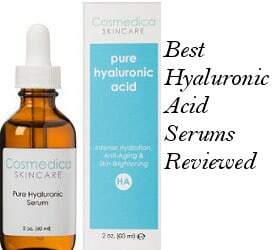 Great for applying eye makeup. This mirror is well designed and can be tilted to view your face from different angles. Its oval shape gives users a great view of both the face and neck and is versatile enough to be moved from room to room easily. The Conair Oval double sided lighted makeup mirror in polished chrome is basically the same mirror as the oiled bronzed finish mirror by the same company only with a different finish. This is approximately 16 inches high from the bottom of the base of the mirror’s stand. The mirror itself is 9 inches wide and has a 60 inch cord. There is an electrical outlet in the base which comes handy for plugging in curling wands when doing your hair. It has a 20 watt bulb and 360 degree rotation to allow you to view your face from different angles. Reviews for the Conair Polished chrome makeup mirror are quite good. Few users think that its light is a little dim, and some others feel that the mirror gets hot but only after several minutes of use. This is a handy mirror. The oval shape allows you to get a good view of your entire face and neck. The lights may get quite warm so you will need to be careful when attempting to move it after using it for several minutes. The Jerdon 6 inch portable lighted mirror with white finish is a lightweight and well designed item perfect for use both at home and when traveling. It uses 7 watt light bulbs and the switch turns the lights on and off. This is actually 3 mirrors with the two side mirrors hinged so that you can view your face from all different angles. If you are planning on taking it with you when traveling, keep the box as it helps to protect the exposed bulbs. 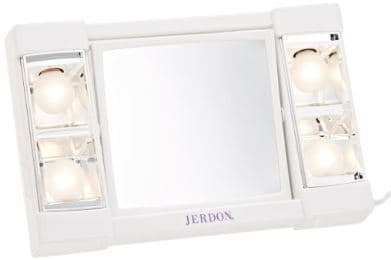 Reviews for the Jerdon J1010 Mirror are above average with the vast majority of users really finding it handy for putting on makeup properly. Designed well and good viewing angles. The Conair Reflections collection mirror is a battery operated LED lighted mirror that takes 3AA batteries. However, the batteries are sold separately. 1 X and 7X magnification. Battery operated using 3AA batteries. Reviews for this product are above average. Although some users admit that the batteries are not long lasting, they still like the fact that they are easy to purchase. Mirror can be used anywhere. Can see the entire face when applying makeup. This is a good mirror that you can use anywhere in the house or even when camping since it is battery operated. Its oval shape allows you to see your entire face and neck and it is easy to switch from the regular size mirror side to 7X magnification. All in all, finding the best makeup mirror with lights when you don’t have a full size vanity with lighted mirror can be a perfect alternative and allow you to put on your makeup easily, tweeze eyebrows and help you to accomplish the flawless looks you want to achieve. 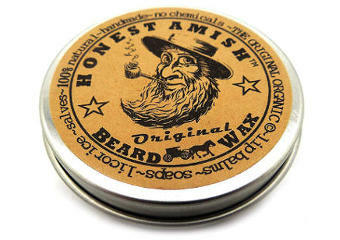 It can also be a very helpful option for men to shave.